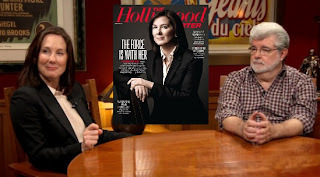 Kennedy already had called Beth Swofford, Abrams’ CAA agent, and been told Abrams was too deeply engaged in the next Star Trek movie and other obligations at Paramount — not to mention innumerable television projects — to consider the job. Nonetheless, Abrams agreed to meet with Kennedy on Dec. 14 at his Bad Robot offices in Santa Monica. Famously plain-spoken, she summarizes her pitch like this: “Please do Star Wars.” And she had cards to play. Not only was Oscar winner Michael Arndt (Little Miss Sunshine, Toy Story 3) writing the script, but Lawrence Kasdan, who wrote 1980′s The Empire Strikes Back and 1983′s Return of the Jedi, was on board to consult. Abrams “was flipping out when he found out that Michael and Larry were on the movie already,” says Kennedy. Indeed, the six Star Wars films have grossed more than $4.3 billion at the worldwide box office and spawned an empire that includes TV spinoffs like The Clone Wars, books, theme park rides and, of course, merchandise sales. Disney has said Lucasfilm generated about $215 million in licensing revenue in 2012 without having released a Star Wars-related movie in five years. Managed correctly, Star Wars by far is the most valuable franchise in Hollywood, making Kennedy — its new steward — one of the most powerful figures in entertainment.